Disco Mommy's Random Thoughts: Busy Busy! Jon took the scouts to visit a Radio Station-Dylan is practicing to take over Daddy's job at the Drive Through Nativity this year! The kids dyed Easter Eggs with their Great-Grandma. raising over $70,000 for HCS! Gina took the kids to the Flashlight Egg hunt..it was a blast! 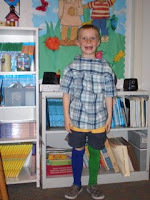 Dylan had Wacky Wednesday at School...he loved being able to get away with being the "Class Clown" for a day! Jon took the scouts to the police station. They didn't arrest Jon which was nice. This adorable angel showed her generous heart, giving her playmate a $20 from her wallet. Thankfully the money was returned once the other Mommy discovered what had happened. Megan insisted she only gave her "one" so it can't be too much money! So we have had a lesson on money and a talk about taking playmates into Mommy and Daddy's room and showing them were we hide our money. Dylan took his test to earn his green stripe in Tae Kwan Do. He did an awesome job! We will know in two weeks if he passed! The Leprechauns paid us a visit. They were up to a lot of mischief while we were sleeping (yes, that's Dylan's undies on the ceiling fan...that created hysterical laughing!). They also left some fun gifts behind! Yesterday Dylan won his class competition for the ACSI Speech Meet. He is going to the finals in May! We are so proud of him. He said the entire 23rd Psalm, King James version flawlessly. He even finished with a beautiful explanation of the verse. He is excited about getting a day off school in May to compete against other Christian Schools! Yesterday Megan got her final instructions for the routine she will be performing at her Ballet recital. The final pose has Megan walking forward and kneeling down while the other girls pose behind her. Nothing is lost on her. She immediately told me that it meant she would be right in front where everyone would see her! She is a hoot! We are on Spring Break now. We will be serving at Church on Saturday, attending on Sunday, then heading to my Grandmas for an Easter Brunch. We are sneaking out early to head to Palm Springs for a few days of Family Time!! We plan to do the Aerial Tramway (I am frightened), the Living Desert, swim, rest, play games and just enjoy some time together. I was Baptized a year ago this weekend. It makes it very special to me that I can celebrate Easter and that "birth"day together this year. What a gift! I hope you all have a beautiful Easter filled with love and blessings! Wow - you HAVE been busy! This post was so much fun to read - I especially like the $20 bill story and the note asking the leprechaun's to please not pee in the toilet. If I don't you guys at church over the weekend, have a great Easter and wonderful vacation! Sorry - forgot something (I really need to proof my posts before publishing). Congratulations on your baptism anniversary - what a wonderful thing to celebrate! Happy Birthday! I remember when you were baptized last year...that was an awesome surprise. Just so you know...I hate aerial tramways too. It's not natural to willingly sit hundreds of feet in the air inside a flimsy metal box box attached to a cable by a couple of wheels. Gina - I feel like I don't know you anymore. How has all this happened and I had no idea. I hate being sick. :o( But I am glad your family is having so much fun! Enjoy Palm Springs! We love you guys.